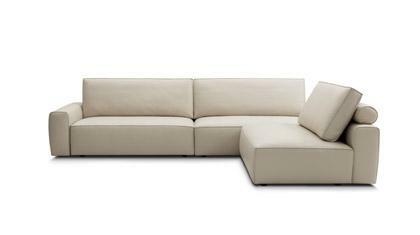 The Time Break sectional sofa is available in standard dimensions or can be custom made according to your needs. Shop on-line or in one of our showrooms, our furniture consultants are ready to assist you. Time Break is an elegant sectional sofa that can satisfy the most exigent customers. This sofa amazes for the absolute comfort and the lightness of its forms. The shaped feet in chromium-plated bright black steel give brilliance and a touch of glamour to the model, available in numberless compositions. A team of professionals makes the Time Break sectional sofa.